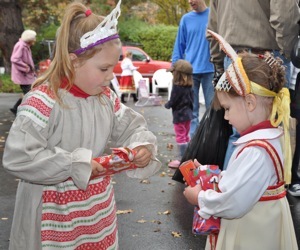 One of the best kept secrets – although hiding in plain sight – is the annual Christmas Bazaar staged by Menlo Park’s Russian Orthodox Church, the Nativity of the Holy Virgin, the first weekend in December. Devotees arrive early to stock up on the freshly-prepared Russian food and pastries. Children and adults from the church come in costume and perform songs and dances, adding to the festive air. And then there are the extremely reasonably priced grab bag gift bins, where two young girls headed soon after arriving this morning. The Bazaar, on Crane St. between Oak Grove and Valparaiso, continues through 4:00 pm today (12/4).